Through her photographic practice, Yvonne Todd explores archetypes of exaggerated femininity. Her portraits of women, heavily made up and often wearing wigs and embellished costumes, play out an overtly stylized and kitsch depiction of a feminine aesthetic that often tips into the surreal. Todd offsets the glamorised artifice of these staged photographs by distorting certain features and introducing elements of the bizarre and grotesque. 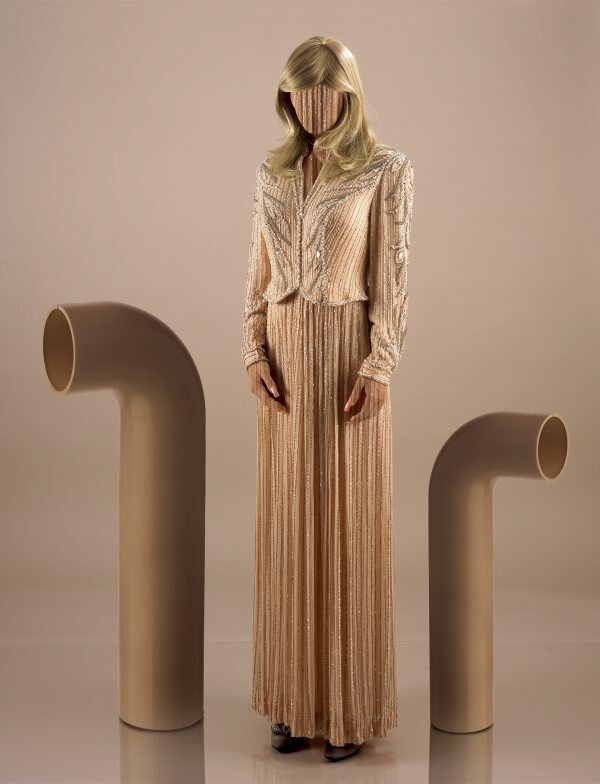 In ‘Pipe Study’, a woman stands against a depthless beige studio backdrop and is flanked by two oversize pipes in a similar beige hue. This light brown tone is echoed in the woman’s sequined jacket and skirt which were designed by Bob Mackie, the American fashion designer famous for producing costumes for Diana Ross, Liza Minnelli, Cher and many others. Segments of the gown have been digitally superimposed on top of the woman’s hands, neck and face to completely mask her identity. The ornate gown acts as a screen, turning the woman into a faceless mannequin and reducing the human form to a sequined veneer. The blond wig and long pink acrylic nails heighten the sense of contrived artifice. Standing in the centre of the image, the woman commands attention yet her stance is reserved and unassertive. Like the pipes, she becomes an inanimate object. The vertical pull of the gown, with its multiple small pleats, relates more to the structure of a Doric column from classical Greek architecture than the human figure. Pipes are a recurring motif throughout Todd’s work and appear in many of her still life photographs. Invoking allusions to the female reproductive system, Todd’s pipes are ambiguously sexual forms. Coupled with the faceless figure in ‘Pipe study’, the giant beige pipes become surreal totems to an effaced and synthetically fabricated sense of womanhood. Signed and dated u.l. verso frame, black ink ".../ .../ Yvonne Todd/ 2008".